The 14k white gold engagement ring has 28 round diamonds that total .20 carats. The wedding band has 19 round diamonds that total .19 carats. All diamonds have a color of G-H and clarity of SI. 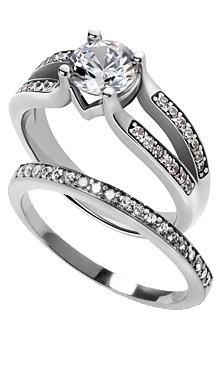 The center setting will accommodate a diamond between 0.46 carats and 1.10 carats that you choose from our inventory.